A black and white photograph of Henry Street High School at 600 Henry Street. 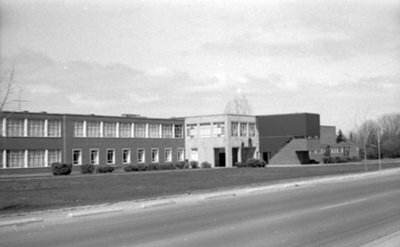 Whitby District High School was built in 1953/54 and opened on November 5, 1954. Additions were made to the school in 1957 and 1970. After Anderson Collegiate opened in 1961, it was renamed Henry Street High School. 600 Henry Street, April 1976, Brian Winter. Whitby Archives A2013_004_016C.